When it comes to brand loyalty, you all know one of my very favorite tried and trues… Barrington! I have been an avid fan of this bags and leather goods line since my first St. Anne tote years ago (we’re talking 2014, y’all…) and each season, I look forward to seeing the gorgeous new prints and patterns released. Yesterday, the new Barrington spring and summer prints hit the web, and it’s safe to say I’m obsessed! From palm leaves to lemons and everything in between, something tells me there’s a perfect combination for everyone. 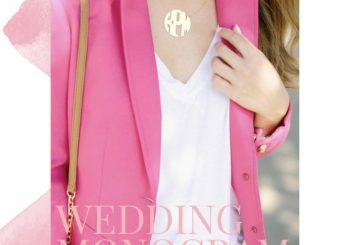 I spent some (ok, wayyy too much) time this morning playing around with my favorite monogram combinations, and thought I’d share them all with you today! Simply click on an item to shop. Since there are endless color and monogram combinations, the sky is the limit when it comes to designing your dream bag! I hope this gives you some fun inspiration, whether you’re looking for a new everyday tote of your own or a gift for someone special! The quality is literally unbelievable, y’all. I always talk about the tote I wore for two years straight in college. I packed it to the brim with a heavy laptop, books, etc and lugged it everywhere. It’s still in amazing condition! These bags LAST. Secondly, I plan on doing a full blog post on this soon, but THIS purse organizer insert has literally changed my life. I love it so much that I ordered my mom one for Christmas, and now she’s obsessed! It fits in the St. Anne perfectly. Enjoy!